Hybrid Solar Wind Energy Storage Market size for 2016 was over USD 1 billion and the cumulative capacity is set to exceed 1 GW by 2024. Increasing demand for reliable and uninterrupted power supply will drive the hybrid solar wind energy storage market size. Growing concerns toward ineffective grid infrastructure along with demand supply mismatch primarily across developing economies will augment the industry landscape. Growing demand for clean energy, deployment of smart grid networks, and the need to ensure reliability and stability of RE systems have led to the adoption of these systems. Favourable government initiatives toward the deployment of sustainable technologies along with robust economic growth primarily across Asia Pacific and Africa will boost the hybrid solar wind energy storage market growth. Growing consumer awareness toward the adoption of sustainable energy mix will favour the business growth. The Government of China has introduced numerous financial incentives, schemes, and subsidies to attract new investments in the country. Increasing public and private funding toward the electrification across off-grid and isolated areas will positively impact the hybrid solar wind energy storage market share. Growing investments from various financial institutions including of International Finance Corporation (IFC) and regional development banks, including African Development Bank and Asian Development Bank, will further drive the business landscape. In 2016, International Energy Agency (IEA) proclaimed an overall investment of USD 718 billion toward electrification across the globe. Standalone system is anticipated to witness growth over 5% by 2024. Renewable capacity addition targets along with favourable government incentives to promote the adoption of sustainable systems will boost the hybrid solar wind energy storage market. As per Ministry of New and Renewable Energy (MNRE) the total capacity addition target from renewables for year 2018 is 14,450 MW. Residential hybrid solar wind energy storage market size is predicted to grow over 7% by 2024. Ongoing electrification program across developing economies along with growing awareness toward the adoption of RE systems will stimulate the industry growth. As per National Renewable Energy Laboratory, the Township Electrification Program have facilitated almost 97% of Chinese households with renewable energy. Growing measures toward the adoption of sustainable systems to execute the industrial operations coupled with stringent norms toward emissions reduction will boost the hybrid solar wind energy storage market. As per European environment agency, the electricity consumption across Europe increased by 26.4% in last decade accounting for 2.4% increase by industrial sector. 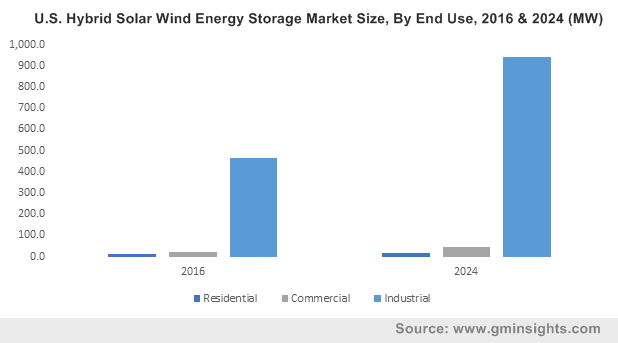 U.S. hybrid solar wind energy storage market share is predicted to witness strong growth on account of shifting focus toward renewable energy integration. Increasing electricity demand owing to rapid industrialization and commercialization will fuel the industry growth. In 2015, the Invenergy announced operation Grand Ridge Energy Storage project in the U.S with capacity of 31.5 MW. The project is located at Grand Ridge Energy Centre, which includes 20 MW of solar, 210 MW of wind and 1.5 MW of energy storage unit. Ongoing technological advancements coupled with declining prices of storage systems will fuel the UK hybrid solar wind energy storage market. Abundant availability of wind and solar energy along with compatible geographical conditions will stimulate the business growth. Government initiatives to promote renewable energy across the nation will further boost the industry landscape. The EU Renewable Energy Directive (Directive 2009/28/EC) introduced the target of 20% final energy consumption from renewable sources by 2020. Rapid urbanization coupled with the need for reliable grid infrastructure will augment the China hybrid solar wind energy storage market. Rising investments toward the deployment of sustainable technologies with an aim to meet the growing electricity demand will augment the industry landscape. As of 2017, the Zhangbei National Wind and Solar Energy Storage and Transmission Demonstration Project accounts for 18 MW of storage capacity with overall capacity exceeding 200 MW. Notable hybrid solar wind energy storage market participants include ReGen Powertech, General Electric, Vestas, Siemens Gamesa, Vattenfall AB, Goldwind, Suzlon, Alpha Windmills, Blue Pacific Solar, Zenith Solar, Unitron Energy, Polar Power, Grupo Dragon, Tesla and A123 Systems. Major players across industry are focussing on mergers and collaborations as a part of their strategic move towards product development. Siemens collaborated with AES with an objective to form a new energy storage company. The joint venture, Fluence, will integrate AES’ operational excellence in utility-scale storage with Siemens’ engineering & sales resources. Hybrid solar wind energy storage system is a combination of solar PV module, wind turbine and storage system to store the energy generated from both the sources. The system possesses improved efficiency and reliability along with the capability to mitigate carbon footprints. Government initiatives toward the adoption of sustainable technologies to meet the growing electricity demand is anticipated to be a key factor propelling industry growth.